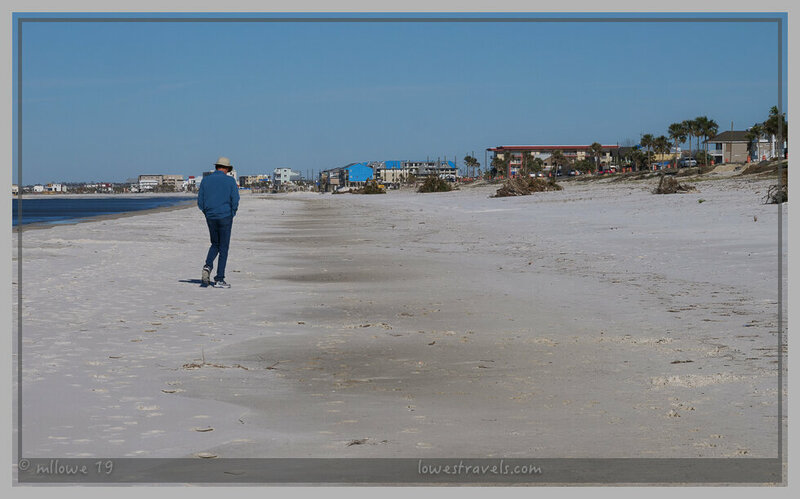 We continued our travels along Florida’s gulf coast, heading northwest through what’s known as the “Forgotten Coast”. 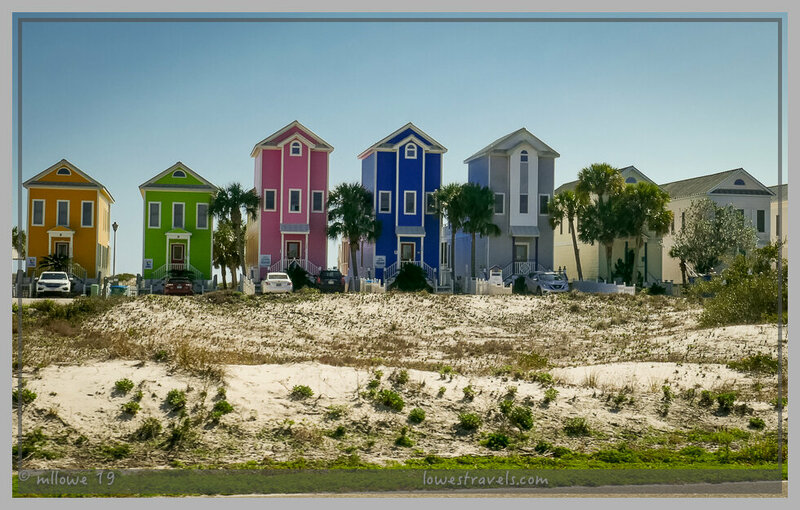 Driving along a quiet and relatively undeveloped section of coastline between St. Marks and Mexico Beach, we paused at the small towns of Eastpoint, Apalachicola (to hang out with friends), Port St. Joe, St. George Island, Cape San Blas and Mexico Beach (ground zero for hurricane Michael). We were able to schedule our time here to coincide with Eric and Laurel’s annual family visit. 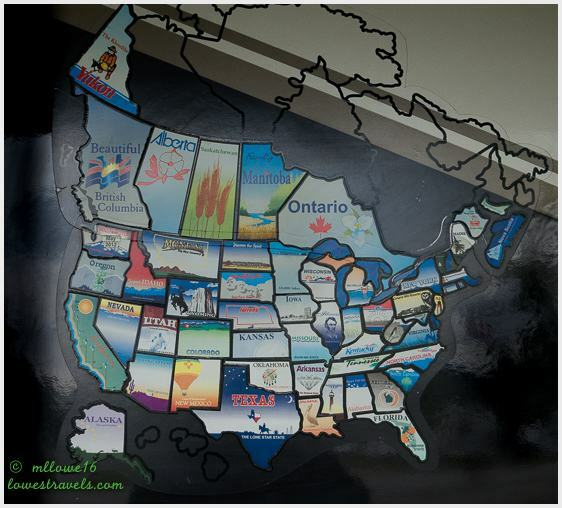 The RV resort we chose in Eastpoint was only a few miles from where their parents live, making our get-togethers convenient. We even had our initial meal at the same restaurant where we first met five years ago. Since then we’ve reconnected several times as our paths have crossed, forging a great friendship. We always look forward to seeing these great folks! 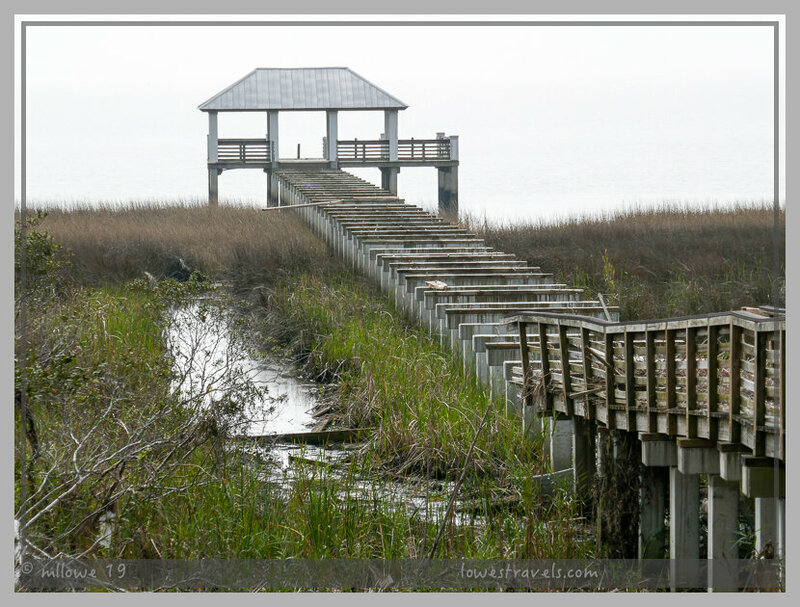 The port city of Apalachicola is a warm, welcoming place bursting with hometown charm. We strolled all around the historic downtown area, even seeing the house where Laurel’s dad was born – now that’s some cool local history! We also took a guided tour at the Orman House Historic State Park, where we learned about two hundred years of Apalachicola history and southern traditions. We really liked this town the first time we were here, and we liked it even better this time! A venomous Water Moccasin, Steve was thrilled! 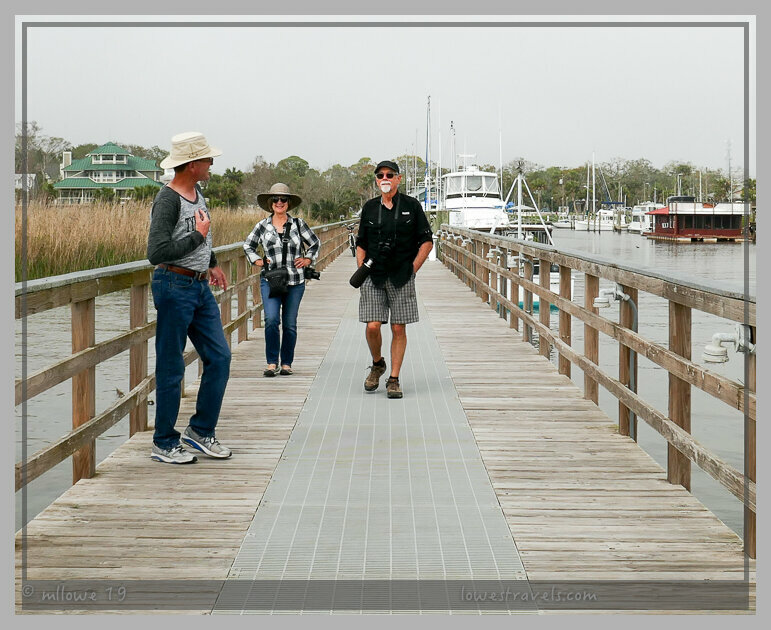 We also visited the Apalachicola National Estuarine Research Reserve, which showcased the importance of the estuary as a major forage area for trans-gulf migratory bird species, while also supporting the local fishing industry. We learned that nearly 90% of Florida’s oyster harvest comes from Apalachicola Bay. 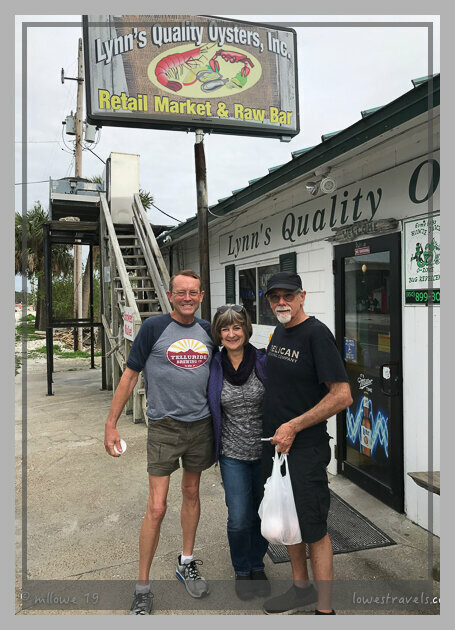 No wonder the town is known as Florida’s “Oyster Capital of the World.” And yeah, we ate a ton of the best oysters you can find anywhere, prepared in many different ways – yum! 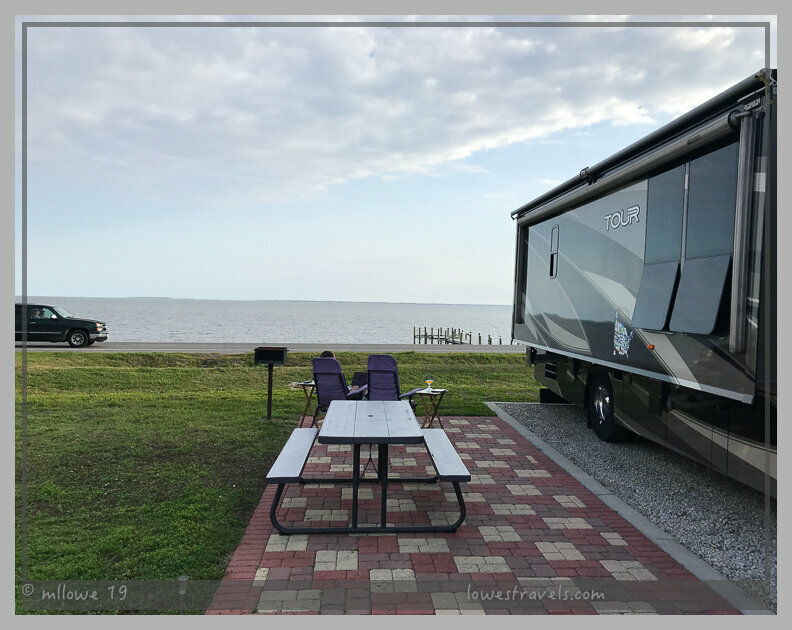 We cut short our stay at Coastline RV Park because the site was located adjacent to horrific traffic noise on highway 98. Although unhappy with the campground, the time we spent with Eric and Laurel made it well worth the stay. We can’t wait to meet up again! 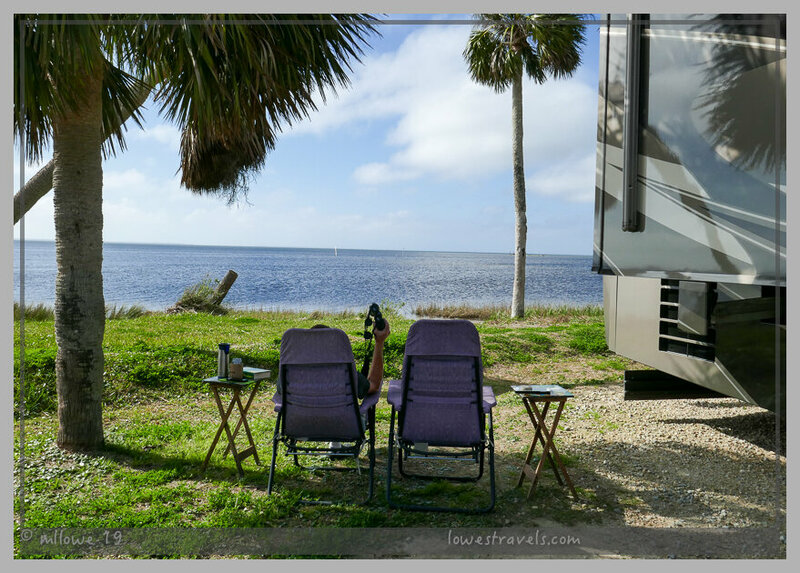 Forty miles north along the coastline we were lucky to snag a site at Presnell’s RV Park at Port St. Joe. 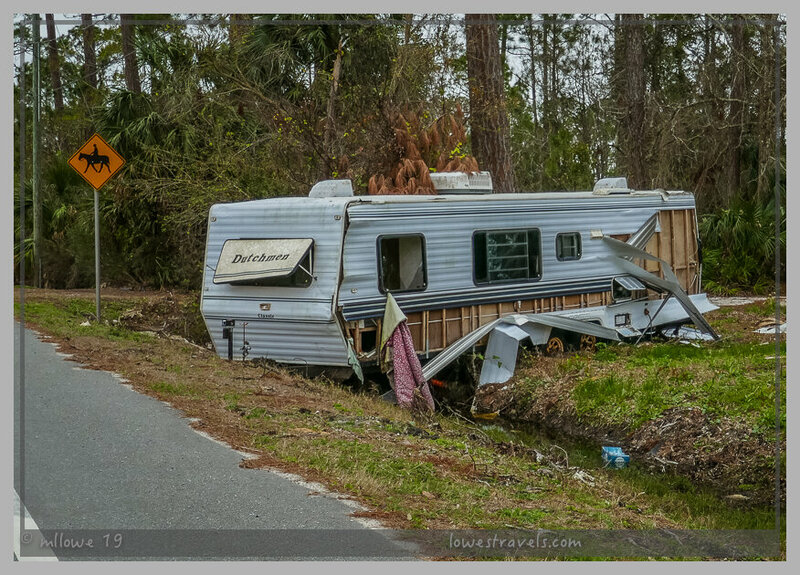 The RV park had partially re-opened during its recovery from hurricane Michael. 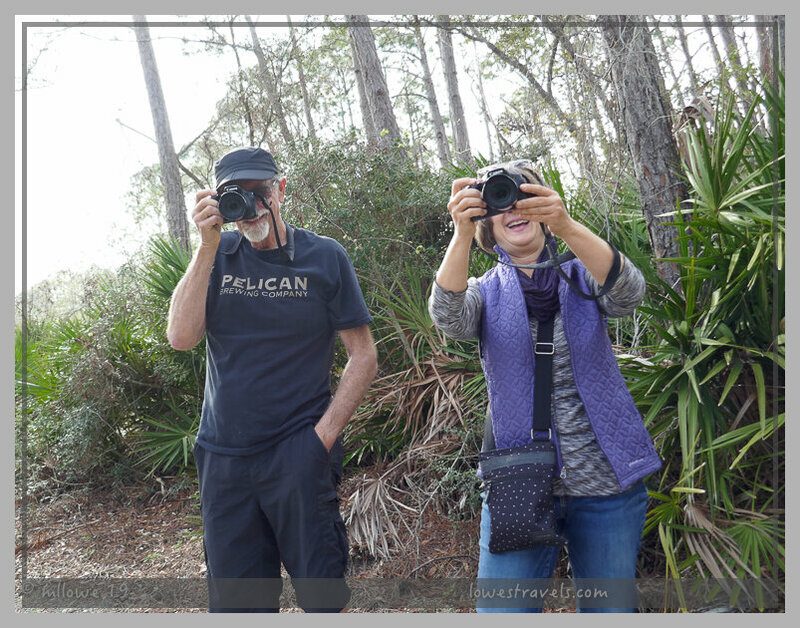 Our amazing (and quiet) gulf-side site with premium bird watching more than made up for the money we lost by leaving the other park early. 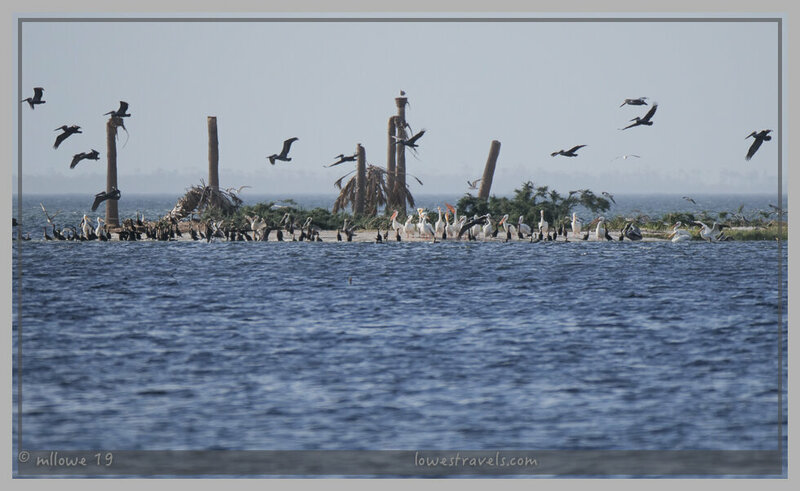 A nearby island full of birds! Our move brought us to a halfway point rendezvous with party buddies Dave and Faye , who were staying at Topsail Hill Preserve SP. 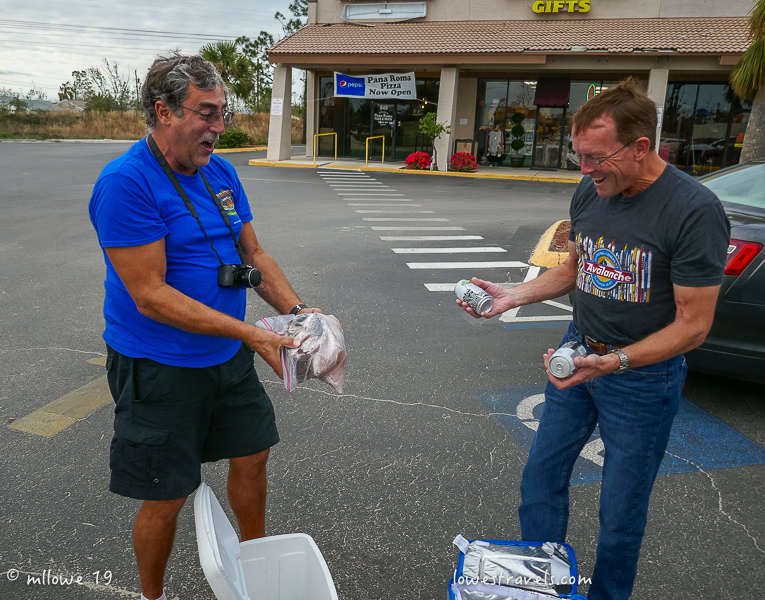 We had planned this get-together several months ago, as Dave had frozen and saved several fish heads for me to make soup as he fished on the gulf coast of Texas (how cool is this guy?). In exchange we gave them some lumpia and stout beer to try. It turned out to be an excellent trade, as the soup made Steve’s eyes roll back in his head! Hanging with Dave and Faye is guaranteed to be a good time! 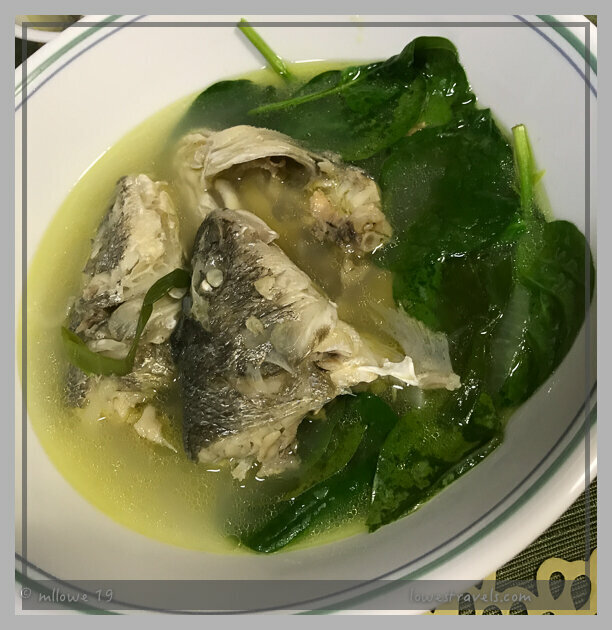 Steve said it was the best fish soup I’ve ever made! 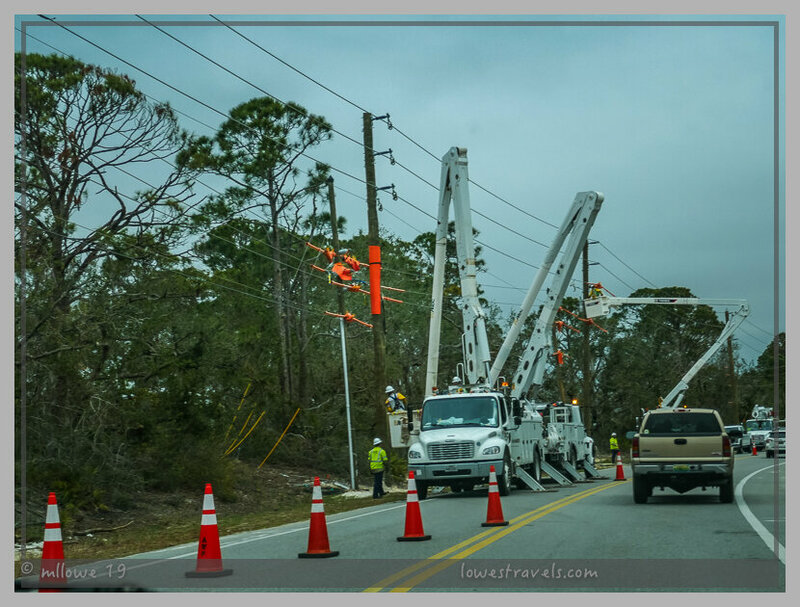 Driving around Eastpoint and Apalachicola, we’d already begun to see some damage from hurricane Michael. 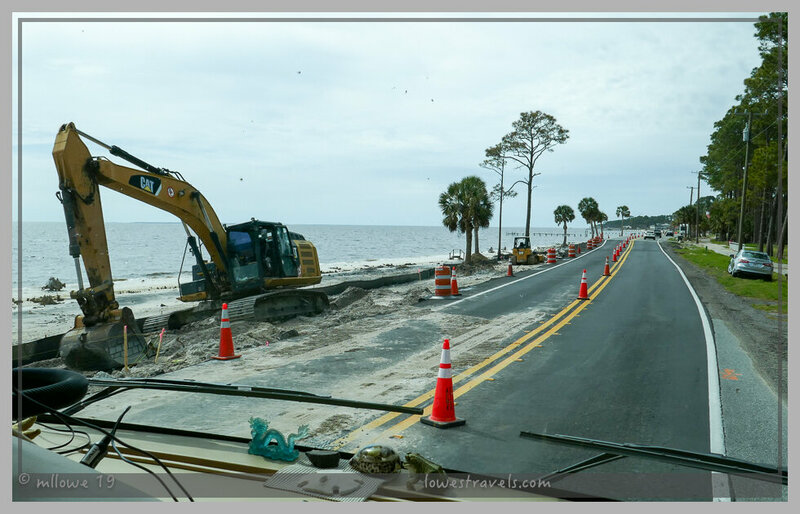 But as we drove through Mexico Beach to meet up with Dave and Faye we were totally shocked by what we saw between Port St. Joe and the little town of Mexico Beach, where the eye of the hurricane struck last October. Even five months later the destruction remains almost complete, and as we drove back home at dusk it was eerie to see the town dark and deserted. A very heartbreaking sight that we will not forget. 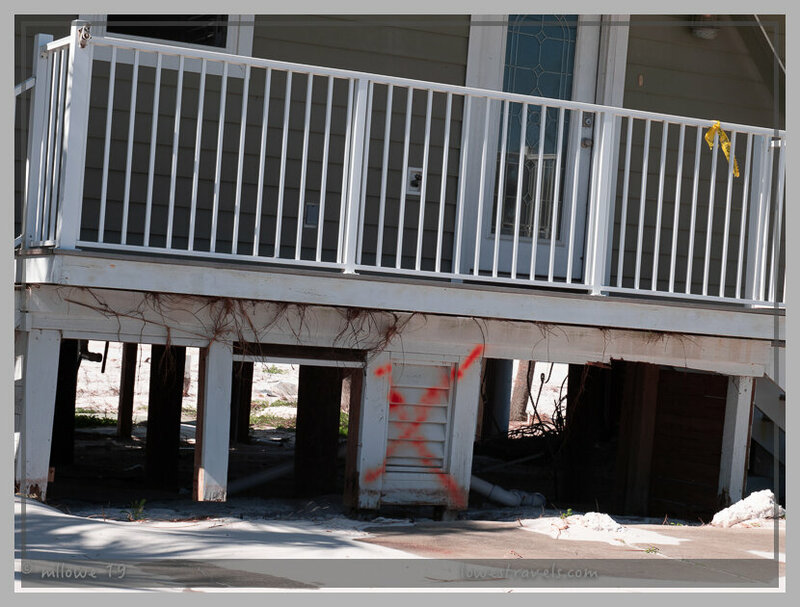 Five months after the horrible hurricane, signs of recovery and rebuilding are only beginning along the Forgotten Coast. Although a few small businesses and restaurants have reopened, this is a place that will not return to anything close to normalcy for a long time to come. 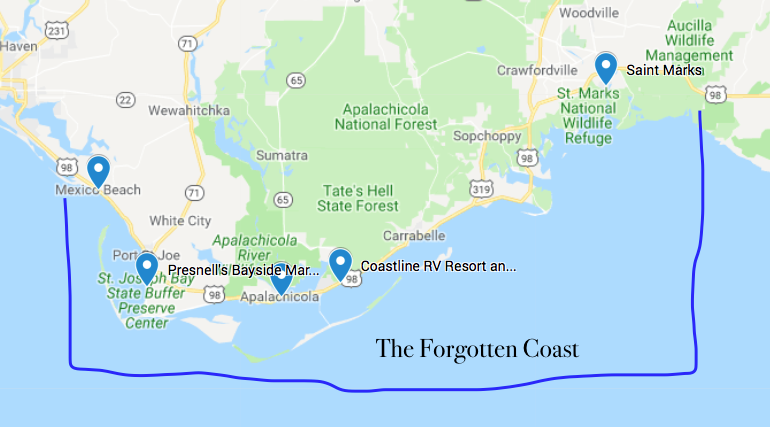 The Forgotten Coast is forgotten no more after Michael. This community will fight to retain their casual, off the beaten path feel, continuing to push back against high rise condos and large crowds. Our hearts go out to these folks who have such a long road to recovery. Mexico Beach is still accepting donations if you wish to help. It’s always great to spend time with friends. 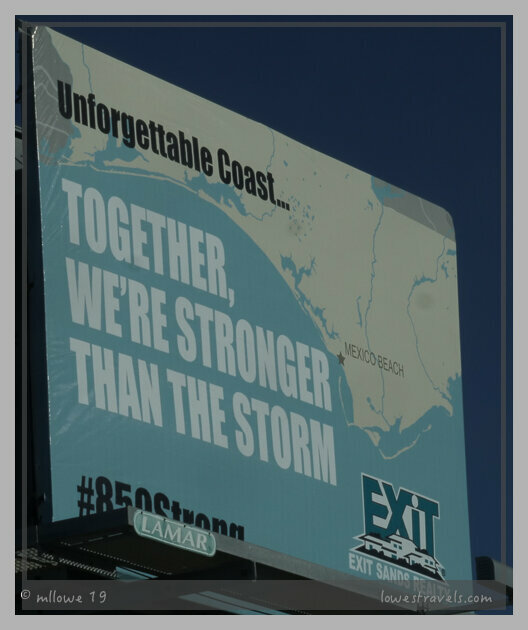 Just a couple weeks before you spent time on the Forgotten Coast a friend drove through the devastated areas. So, so sad … and it takes so long to recover from something that tooks mere minutes to be destroyed. Good times with good friends are the best. You don’t realize how bad the storms are until you see the results. Fish heads for beer huh? I’ll bet it tasted delicious. 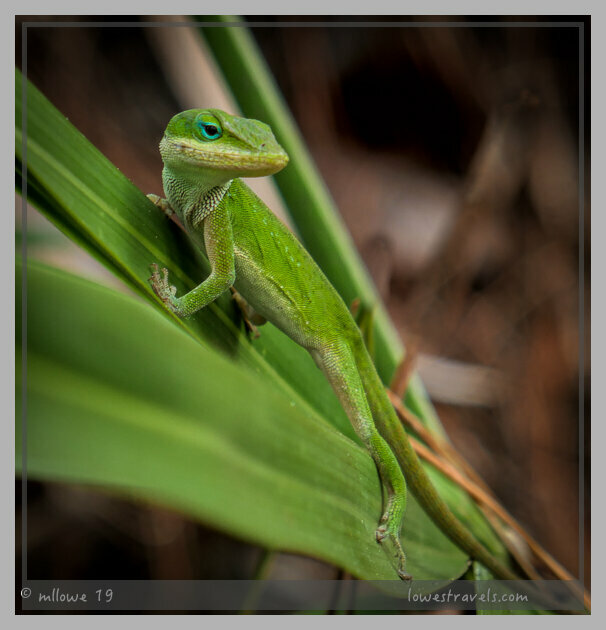 Love the green lizard picture. Beautiful scenery until the hurricane damage. Just wow. So sad. You’re always having so much fun with friends along the way, yay! Steve truly enjoyed the soup, while I took care of the meat. I wonder when we will cross paths again? So heart breaking to see the devastation there. It’s such a beautiful area of Florida. Hopefully they will be able to rebuild and get back on their feet. It was and we saw lots of rebuilding activities. With no hotels nor condos or home rentals nor restaurants left, it will be a long while to get back to normalcy. The destruction along the coast is mind boggling. I do hope they rebuild and I appreciate that they are focused on maintaining the character that existed before. It would be too easy, and too sad, for it to come back completely different. Whenever we head through the area, we’ll certainly make an effort to patronize whatever businesses are open. I think that’s a great way to support the rebuilding efforts. 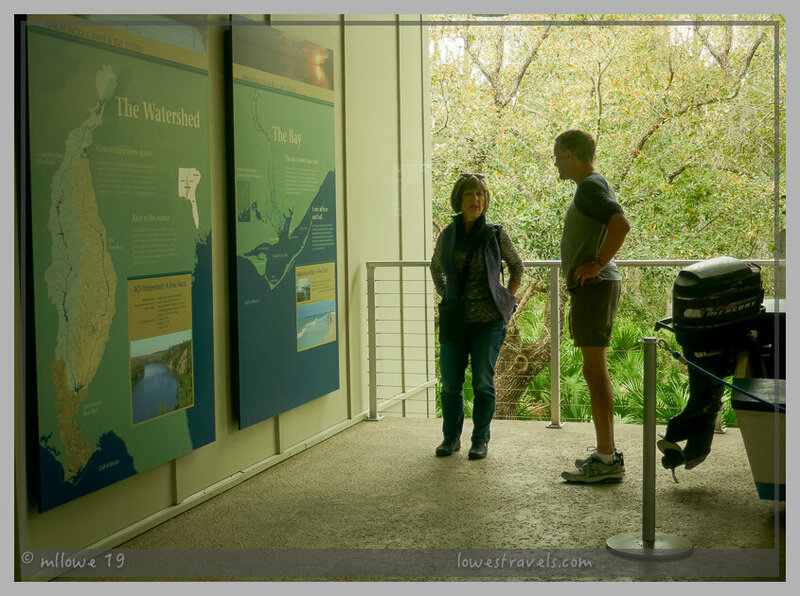 Laurel and Eric are the best local tour guide for sure! Now you are being funny Laura, as much as we like you, there is no way I will let Steve talk me into wintering in Florida again! But does that mean you are not coming back west too? Sure looks like a wonderful time with Laurel and Eric. I love the photo of you and Laurel:) Glad you were able to time a meet up. I’m not sure about the soup. Too many eyes!! 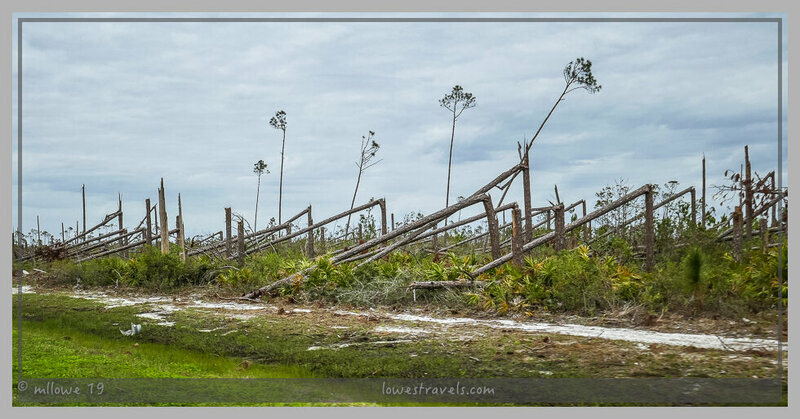 What sadness to see the destruction from Michael. It is amazing to see how much still needs to done in this area. Like you said it will be a very long recovery. Our hearts go out those who have been effected. Safe travels as you move on. We are also glad that they made time for us, knowing how busy Laurel is with taking care of her parent’s affairs. Steve really enjoyed the soup, while I took care of the fish meat sans eyes 🙂 We do like this area, less crowd great seafood and beautiful beaches! So sad to see the devastation at Mexico Beach. That area was on our original route west last fall, but we changed course when we saw what could happen in our path. It looks like it was a beautiful place. Great to see your pictures and hear your stories of time with Laurel and Eric. Such fun moments in this life on the road. “made Steve’s eyes roll back in his head” isn’t a ringing endorsement for soup in my book! I assume he liked it though, right? I wonder if our paths will cross as you move west and we head east? 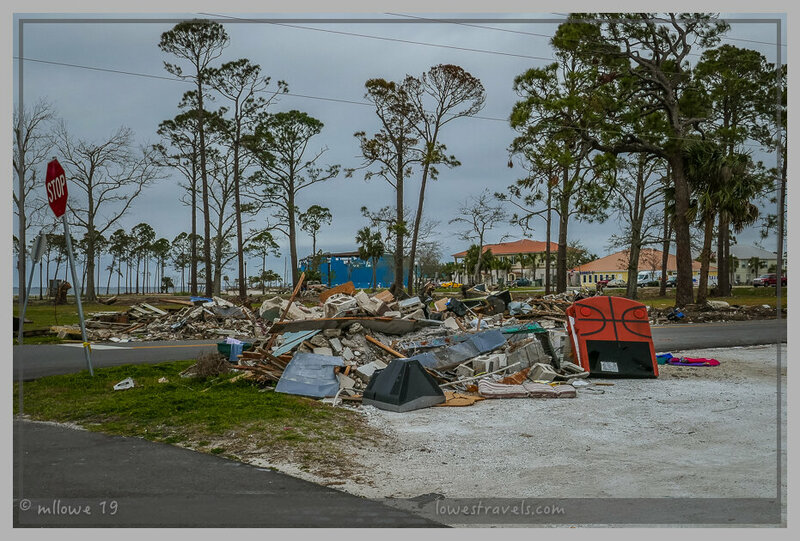 Little did we know that we would be passing Mexico Beach but in a way we were glad in a sad way that we saw the devastation. 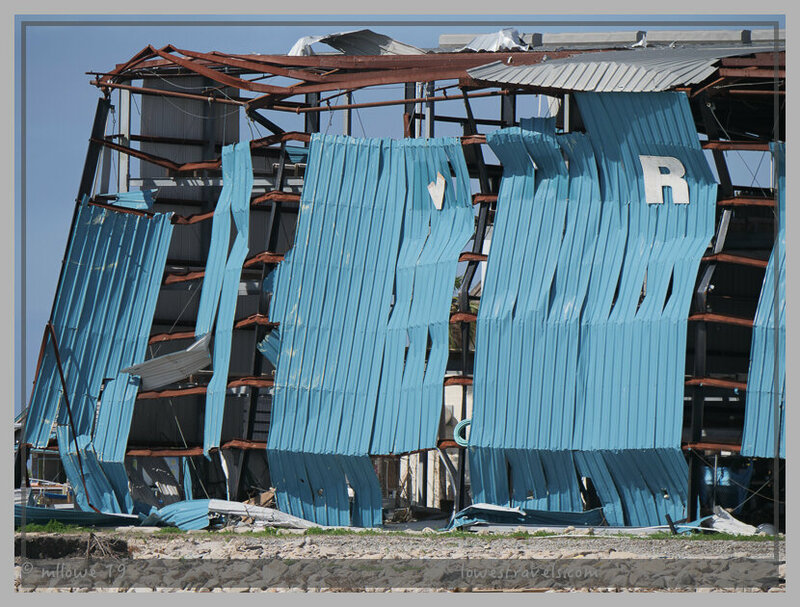 But, we saw lots of construction/rebuilding activities as well as clean, still lots of debris everywhere. 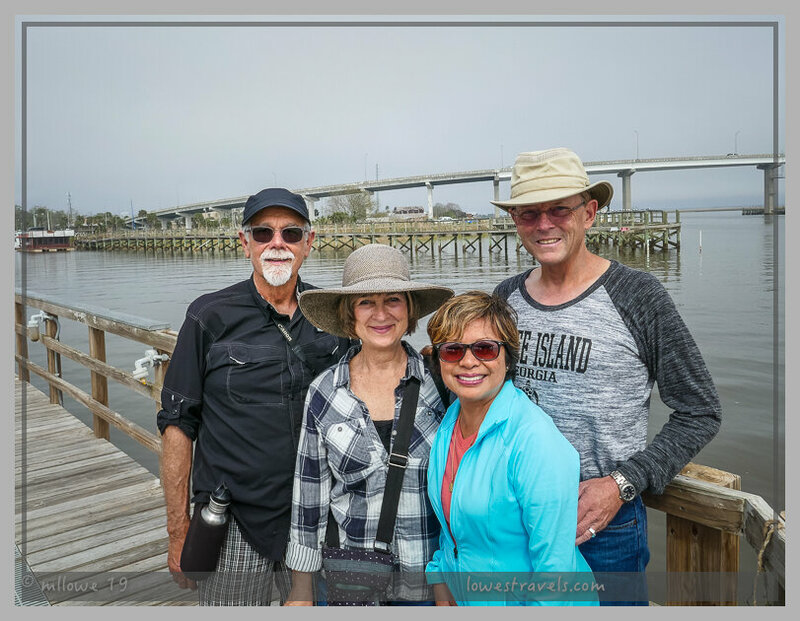 We’re so happy that you made time for a good long visit with us to explore Apalachicola together. I wish the weather had been better. Hot, muggy, chilly, gray, windy—we had it all while you were here. Such a strange winter. But we always have a great time with you two, no matter where we are or what the weather is like. 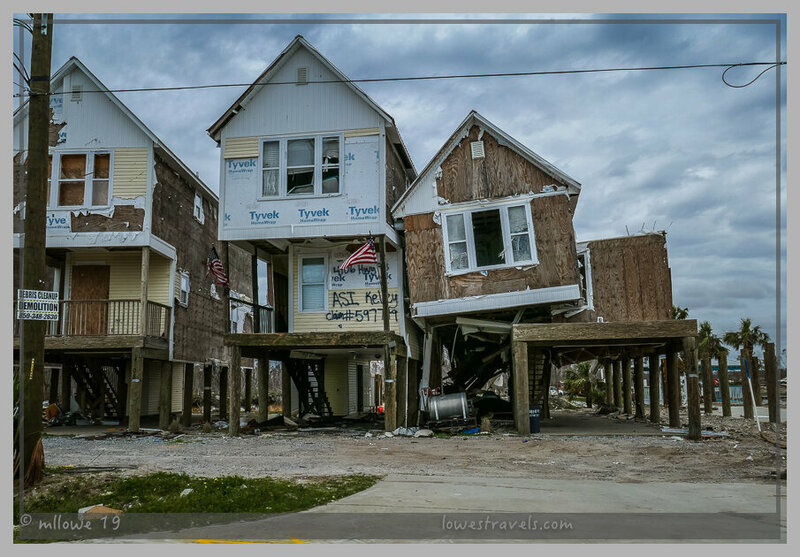 We haven’t yet been to Mexico Beach—the devastation is shocking to see in your photos. Apalachicola was really lucky this time around. Hope you get some beautiful beach days before you leave the Sunshine State! Oh my goodness Laurel, we truly appreciate your time spent with us! We just hope we did not take too much time out away from your parents. So glad you had lots and lots of those yummy Appalachicola oysters! I love the photo of you and Laurel. Totally awesome to spend time with friends as personal guides. 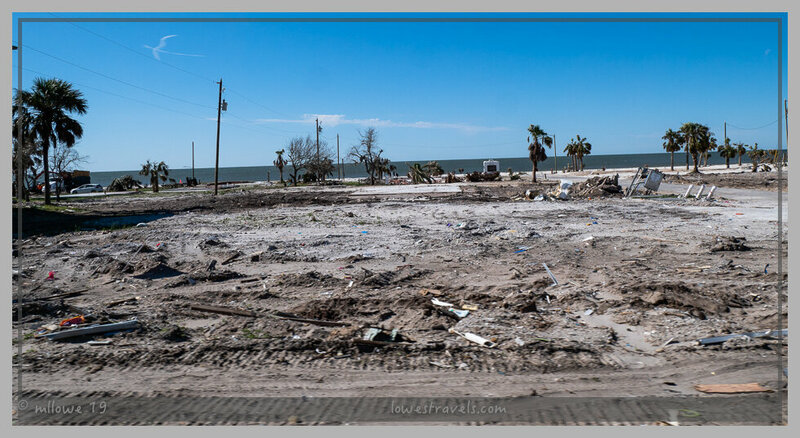 It is sad to see the pictures of Mexico Beach and the area…I’m sure it will take years for them to recover. 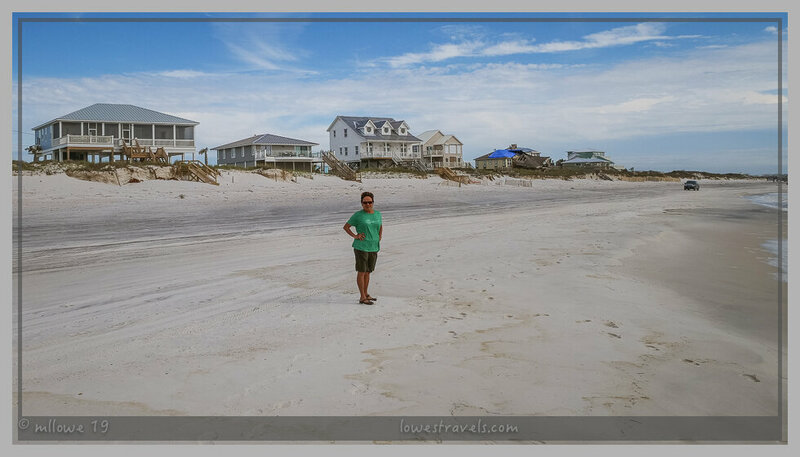 And tell Steve I love his Tybee Island T-shirt! Steve is glad you noticed his T-shirt 🙂 And boy did we really ate more than enough oysters in our travels. We thought if we have to have them fresh, Apalachicola is the place to have them. So sad to see such devastation. 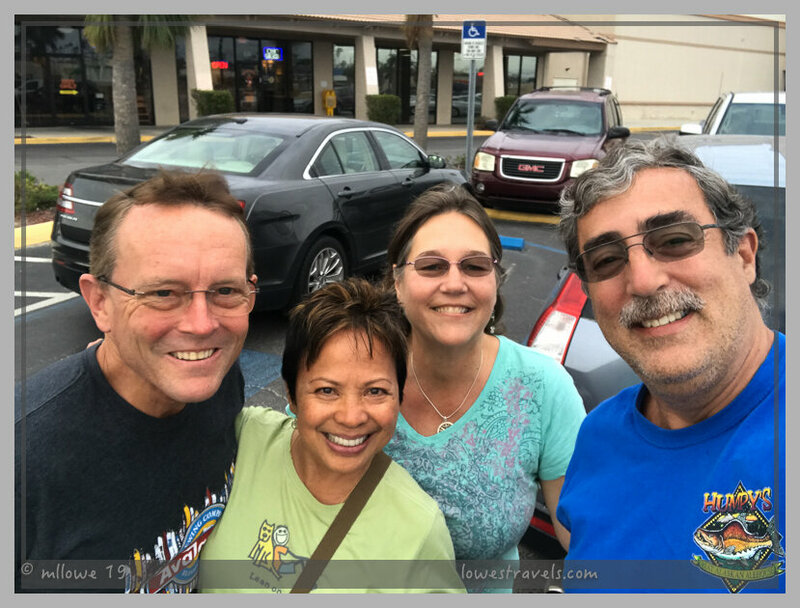 Glad you were able to connect with friends … always a fun time! We look forward to meeting, again and again, our kindred spirits. I hope we get to see each other at springtime! Keep us posted on your arrival to Tucson. 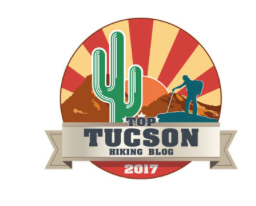 The saguaros will probably be blooming … always a treat. Thank you Terri, glad you liked it. So glad that you were able to meet up with Faye and Dave! 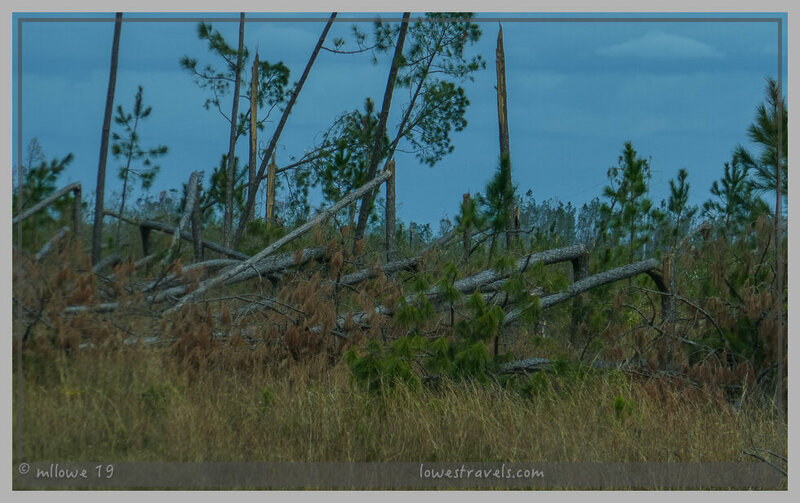 We were amazed at the damage from the hurricane along I-10, miles from the actual coast. It totally devastated entire forests. I cannot imagine what it looked like along the coast itself! Dave and Faye need room in their freezer so we have to meet them so I can have the fish heads 🙂 It was shocking to see the devastation, never seen anything like it. 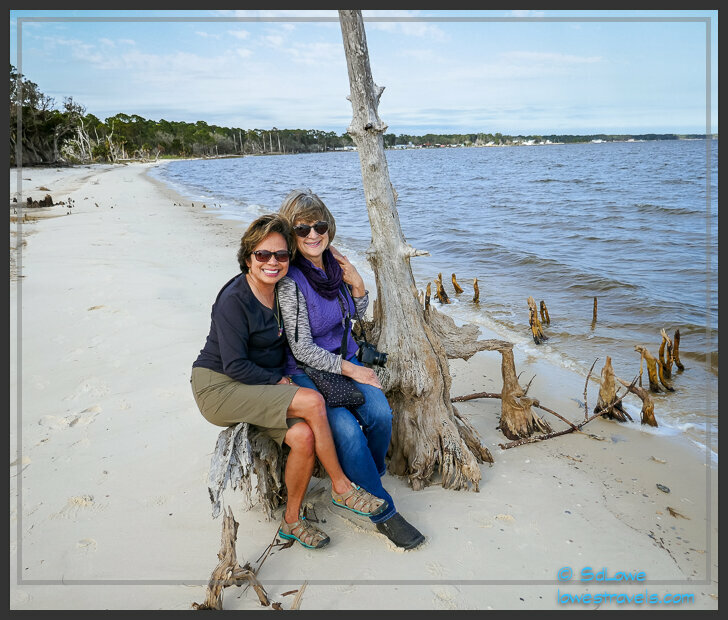 Oh how much fun your visits with friends looked, and how charming Apalachicola is! I love the picture of you by the “matching” house, and I agree that red dress is dreamy. I couldn’t tell, but is Steve actually a fan of snakes or quite the opposite? It was nice of them to protect that one from being squished even if it was a scary kind. The hurricane devastation is quite sobering. I hope the communities can recover and pray they all stay safe in the future. You, too, as you make your way west again; watch the skies, Mother Nature is waking up a bit cranky this year. Ha ha ha, We seemed to encounter snakes whether hiking or just strolling on the road! We had tons of laughter and fun, for we had the best personal local tour guide!